There has long been a rumor circulating that quartz crystal contain monatomic gold which can be extracted by simply heating the quartz in a strong lye solution since silicon is slowly attacked and dissolved by strong alkali solutions. Most of the stones you find which are clear, are actually quartz. And all sand is quartz (silicon dioxide). So there are some people who are even selling a precipitant made from sand which they claim is natural white powder gold. I theorize that this is simply silicon dioxide and not white powder gold at all. Here I give the step by step process with my results. So there are some people who are even selling a precipitant made from sand which they claim is natural white powder gold. I theorize that this is simply silicon dioxide and not white powder gold at all. Here I give the step by step process with my results. A solution was made of 2 ounces of sodium hydroxide in 300ml of water, then 6 ounces of sand was added. The color seen in these photos is because the sand was the colored kind you find at the art store. I chose to use this since it was already perfectly clean and ready to go, except of course for whatever coloring agent was used on it. The solution was kept just below boiling because when heated too much, little explosion or eruptions of gas would occure beneath the sand and cause it to 'bump' so hard I feared the flask would crack. After 24 hours of this heating (and water was added when too much had evaporated) the solution was allowed to cool and was filtered. The pH was then adjusted down to 1 using hydrochloric acid. 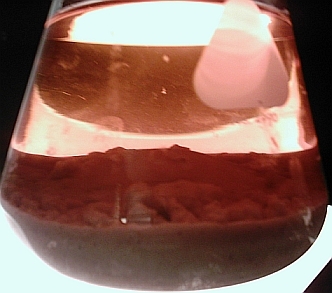 This causes the silicon to precipitate, but not all of it will come out unless the pH is adjusted very slowly and carefully with constant stirring. 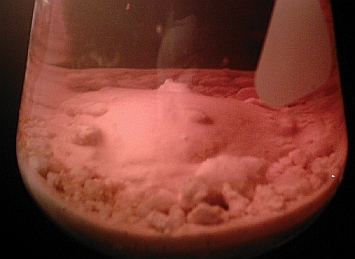 This photo shows the globs of silicon which seem like chunks of fat. The solution was again filtered but now the silicon clogged the paper and the process took many hours since the filters had to constantly be changed. A vacuum filtration would certainly have helped tremendously. 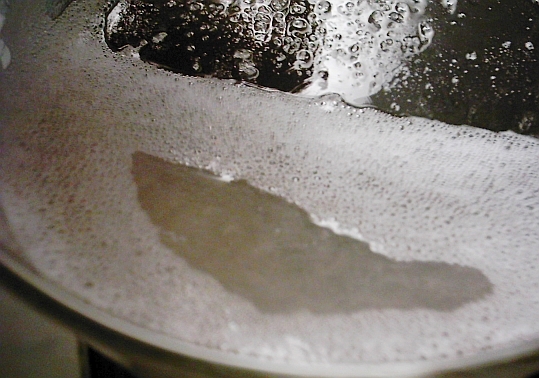 After the precipitant settled, the top water was decanted and fresh water added. This was repeated until the pH was neutral and the water no longer had a salty taste. During the drying of the precipitant, it formed strange balls which looked like glass and would seem to indicate the presence of a large amount of silicon. When completely dry, the balls became tiny rocks. Although they seem hard, when rubbed between the fingers they break down into an ultrafine chalk-like powder. The taste of the powder is sweet at first and dissolves fast in the mouth, yet this powder dissolves poorly in water. 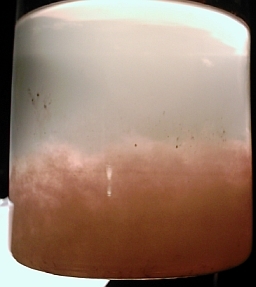 Hydrogen peroxide (3%) was added to the powder and it foamed up and became light tan. 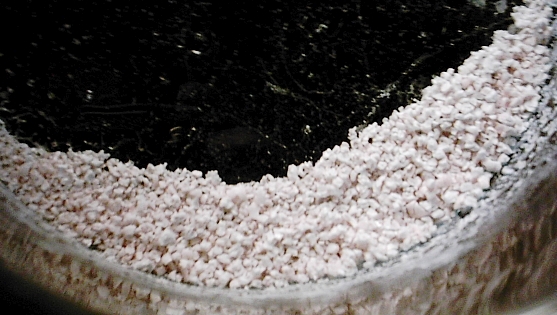 Some of the powder dissolved, and some remained on the bottom which had the appearance of glass beads. When the water was evaporated, the powder returned to pure white. Heating the powder up to 2000°F with a butane flame only made it red hot, but did not melt it. So far all attempts at converting this powder back to normal gold metal have proved futile, which is why I theorize it must just be silicon dioxide. Monatomic white gold will convert back to normal metallic gold when microwaved, burned with sulfur, oxidized with 35% grade peroxide, or if left in strong ultraviolet light, and I have UV lamps so strong they tan the skin, but none of these methods affected this powder. If this is just dissolved quartz, ingesting silicon dioxide in a finely powdered form may not be harmful since it's actually used as fillers for some pills, but they use colloidal silicon dioxide. And there could also very well be any number of heavy metals in this powder which were in the sand, and selling it to people as "White Powder Gold" would be immoral and reprehensible if it was not at least assayed first.